تئوری‌های اخیر اقتصاد بین‌الملل به طور مرسوم جهت‌گیری‌های ابداع را در واکنش به انگیزه‌های اقتصادی به عنوان موتور اصلی پیشرفت فن‌آوری و قدرت رقابت‌پذیری می‌دانند. با این دید، ابداع از یک طرف به دانش ناشی از فعالیت‌های تحقیق و توسعه بستگی دارد و از طرف دیگر ابداع به انباشت دانش کمک می‌کند. در نتیجه، صادرات به انباشت فعالیت‌های تحقیق و توسعه و انباشت دانش مؤثر و ارتباط آن دو بستگی دارد. همچنین می‌توان بیان داشت ارتقاء صادرات هر کشور علاوه بر اینکه تحت تأثیر انباشت فعالیت‌های تحقیق و توسعه در داخل، بلکه تحت تأثیر سرریز انباشت فعالیت‌های تحقیق و توسعه خارجی (از طریق واردات کالا و جریان ورودی سرمایه‌گذاری مستقیم خارجی) نیز قرار دارد. هدف این مطالعه ارزیابی نقش متغیرهای حقیقی انباشت سرمایه فعالیت‌های تحقیق و توسعه داخلی، انباشت سرمایه فعالیت‌های تحقیق و توسعه خارجی (از طریق واردات کالا و جریان ورودی سرمایه‌گذاری مستقیم خارجی) و همچنین متغیرهای قیمتی نرخ ارز و نرخ تورم بر صادرات صنعتی اقتصاد ایران طی دوره 1970-2007 به روشARDL می‌باشد. نتایج تخمین دلالت می‌کند که ضرایب متغیر حقیقی انباشت سرمایه تحقیق و توسعه داخلی، متغیر انباشت تحقیق و توسعه خارجی (سرریز از کانال واردات کالا)، ضریب متغیر انباشت سرمایه تحقیق و توسعه خارجی (سرریز از کانال جریان ورودی سرمایه‌گذاری مستقیم خارجی) مثبت و معنی‌دار است. همچنین ضریب متغیر قیمتی نرخ ارز اثر مثبت و معنی‌دار ولی ضریب متغیر نرخ تورم تأثیر منفی و معنی‌دار بر صادرات صنعتی دارند. Recent theories of international economics traditionally know the oriented innovation in reaction to economic incentives as a principle engine of technological progress and competitiveness. With this view, the innovation depends on knowledge resulting from R&D activities on the one hand and it helps to stock knowledge on the other hand. Consequently, exports to depend on the stock of R&D activities and the stock of effective knowledge and the relationship between them. Also, it can be stated, in addition to promoting exports of each country affected by the stock of domestic R&D activities, but it depends on stock of foreign research and development (through imports of goods and foreign direct investment inflow). 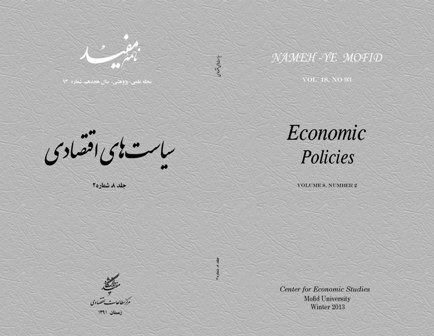 The aim of this study is to evaluate the role of real variables stock of domestic R&D activities, stock of foreign R&D activities (through imports of goods and foreign direct investment inflow) and also price variables, exchange rate and inflation rate on industrial export of Iran's economy during the period 1970-2007 with ARDL approach. Estimation results indicate that real variable coefficient of the stock of domestic R&D capital, stock of foreign R&D activities (through the imports of goods), coefficient stock of foreign R&D capital (spillover from FDI in flow channel) is positive and significant. Also exchange rate has a positive and significant effect but inflation rate’s coefficient has negative and significant on industrial export. ابریشمی، حمید؛ مهرآرا، محسن؛ محسنی، رضا؛ «تأثیر آزادسازی تجاری بر رشد صادرات و واردات»، پژوهش‌نامه بازرگانی، پاییز 1385، شماره 40. شاکری، عباس؛ «عوامل تعیین کننده صادرات غیرنفتی ایران»، پژو هش‌های اقتصادی ایران، 1383، شماره 21. کریمی، فرزاد؛ راشدی، علی؛ «اثرات متقابل تولید و صادرات در اقتصاد ایران با روش معادلات همزمان»، پژوهش‌نامه بازرگانی، تابستان 1380، شماره 19. مهدوی عادلی، محمدحسین؛ نوروزی، روح اله؛ مطهری، محب اله؛ «نقش سرمایه‌ گذاری مستقیم خارجی بر صادرات غیرنفتی در اقتصاد ایران»، دانش و توسعه، تابستان 1388، شماره 27. Alc, A. A. and M. S. Ucal; 2003, "Foreign Direct Investment, Exports and Output Growth of Turkey: Causality Analysis", paper presented at the European Trade Study Group (ETSG) fifth annual conference, Madrid, 11-13. Banga, R; 2003, "The Export- Diversifying Impact of and U.S. Foreign Direct Investments in Indian Manufacturing Sector, Indian Council for Research on International Economic Relations", New Delhi Working Papers, No, 110. Coe, D.T, E. Helpman and A.W. Hoffmaister; 1997, "North – South R&D Spillovers", Economic _ Journal, Vol. 107, PP. 134-99. Dipietro. W and E. Anoruo; 2005, "Creativity, Innovation, and Export Performance",Journal of Policy Modeling, Vol. 28, PP. 133-139. Dixit, A. and J. E. Stiglitz;1977,"Monopolistic Competition and Optimom Product Diversit", American Economic Review, Vol. 67, PP. 297-308. Fagerberg. J; 1999, "The Need for Innovation- Based Growth in Europe", Challenge, Vol. 42, No. 5, PP. 63-78. Griliches, Zvi; 1988, "Productivity Puzzles and R&D: Another Nonexplanation", Journal of Economic Perspectives, No. 2, pp. 9-21. Harris. R and Q. Cherli; 2006, "Exporting, R&D and Absorbtive Capacity in UK Establishments", University of Glasgow. Head. K. Rise. J; "Foreign Direct Investment versus Exports", 2003, www.google.com, Jonuary 11. Hughes Kristy S; 1985, "Export and Innovation",European Economic Review, Vol. 30, PP. 383-399. Johnson, A; 2006, "FDI and Exports: the Case of the High Performing East Asian Economies", Working Paper Series in Economics and Institutions of Innovation with number 57. Jonsen. K;1995,"The Maaroeconomic Effect of Foreign Direct Investment the case of Thailand", World Development, Vol. 23, No. 2, PP. 143-21. Karlsson. C and S. Johanson; 2006, "R&D Accessibility and Regional Export Diversity", Department of Economic. Ledesma. M.L; 2002, "Exports Products Differentiation and Knowledge Spillovers",Department of Economics University of Kent, Email: mal@ukc.ac.uk. ___________ ; 2000, "R&D Spillovers and Export Performance Evidence from the OECD Countries", Depertment of Economics University of Kent, Email: mal@ukc.ac.uk. Lichtenberg, F., & Van Pottelsberghe de la potterei, B; 1998, "International R&D spillovers: A comment", European Economic Review, 42(8), 1483-1491. Liu, X. H. and C. Shu; 2003, "Determinants of Export Performance: Evidence from Chinese Industries", Economics of Planning, Vol. 36, No. 1, pp. 45-67. Metwally, M. M; 2004, "Impact of EU FDI on Economic Growth in Middle Eastern countries", European Business Review, Vol. 16, No. 4, pp. 381-389. Mody A and K. Yilmaz; 2002, "Imported Mochinery for Export Competitiveness", The World Bank Economic Review, Vol. 16, No. 1, PP. 23-48. Montobbio. F and F. Rampa; 2005, "The Impact of Technology and Structural Change on Export Performance in Nine Developing Countries", World Development, Vol. 33, No. 4, PP. 527-54. Rodrigue. J;2007, "FDI, Export and Aggregate Productivity",www.google.com, March 17. Sharma. K; 2003, "Factors Determining India's Export Performance", Journal of Asian Economics, Vol. 14, pp. 435-446. Zhang, K. H & H. Song; 2000, "Promoting exports the Role of Inward FDI in China", China Economic Review, Vol. 11, pp, 385-396.